As someone who has been involved in supporting people on a range of issues, I have been unfortunate in that I have encountered many people intent on pushing their own agenda irrespective of the consequences for others. It’s saddening when what should be a matter of common sense, or even common decency cannot be dealt with on these basic terms. I had hoped that things would be different for troubles related victims but sadly not. Over the past three months I have traveled to a number of meetings providing support to victims. Their initial intention was to seek clarity on the new proposals to deal with so called legacy issues stemming from the Stormont House Agreement, only to later find themselves challenging these proposals, when elements of the legislation were leaked to the public. 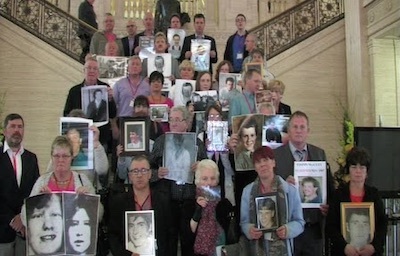 Prior to these meetings some of the victims had never met, yet have now found common ground in the knowledge that these proposals are not in the best interests of all victims. During this time victims have encountered heavy criticism and in some cases have been met with silence from quarters they least expected it. What has been interesting is that some including those most critical of victims are now echoing victims sentiments. During a conversation with a friend we were discussing the legacy proposals. He told me of how some republicans view this latest deal as a good thing and a chance to move on. With this I reminded him of two recent cases: The case of Marian Price and the ‘lost pardon’ and the case of Gerry McGeough and the ‘on the run scheme’. Gerry McGeough lived openly in the north thanks to the ‘on the runs scheme’ or so he thought. McGeough was later arrested at a polling station, having stood in an election and went on to serve a two year prison sentence for troubles related offences. The question as to whether or not his arrest was politically motivated is something that still causes debate. Last year the Secretary of State rescinded the on the run letters following the collapse of the John Downey case over the Hyde park bombing. So needless to say nothing on offer is set in stone irrespective of how some try to sell it. The elements of the legislation recently exposed show that this legislation is mounted in favour of the British State, its agents, military and security services. Anyone deluded or brainwashed enough to believe otherwise should take time to come to the meeting in Derry on October 29th 2015 at 7.30pm in the City Hotel where the proposals are to be discussed in full. Stormont politicians have been directly invited to this meeting to update victims and to address their outstanding concerns. The Historical Investigations Unit is an investigatory body to deal with troubles related cases as is required under the European Convention. Ideally this would be a mechanism free from state interference and with international oversight where possible. The Historical Investigations Unit does not offer this with those who served in policing and security roles in the north during the troubles free to take up position within the new body. Moreover, at a seminar hosted by the Victims Commissioner last week a DOJ official told of how investigating officers would too be seconded from the PSNI. Within the HIU, the Secretary of State will have the power to veto information disclosure by the HIU Director on the grounds of national security and good relations. She too can remove the HIU at her discretion. In addition to this the First and Deputy First Minsters will hold the power to resign or retire the HIU director. How this could be considered independent is completely beyond me. The term conflict of interest wouldn’t even begin to cover this shambles. The Independent Commission for Information Retrieval is set to provide families with answers about what happened to their loved ones, yet those going forward will not receive the names of those responsible as is prohibited under article two of the European Convention. Those giving information will do so on the understanding that their information will not be admissible in Civil, Criminal and Coronial proceedings, leaving a contributor to this body immune from prosecution unless similar evidence appears from another source. What contributors should be aware of is, the information they provide will be held for 5 years with the possibility of extension before being destroyed. The Oral History Archive is said to give people the opportunity to tell their story either now or to have it released at a time of their choosing. As I recently discovered these stories will have to be sanitised as the public records office who will oversee the initiative will be obliged to report all information on criminal activity. This would include membership of paramilitary organisations. I don’t think anyone would deny the need to document the past yet this perceived keenness to sanitise and rewrite a mere 40 year section of our history should be of deep concern to all. Ironically this week the Irish Cabinet is to to debate a proposal to release chosen State papers after 20 years on a phased basis amid growing concerns that Britain’s version of key moments in Anglo-Irish relations is becoming the accepted history. The Implementation and Reconciliation Group will no longer feature in the legislation despite being a core element of the proposals. The IRG is rumored to be a mop that will clean up the remainder of issues outstanding after the five year period as is the estimated life span of the HIU. As you would expect this is being strenuously denied by those party to discussions central to the Stormont House Agreement. My question is will this mop take under its shaft the licences many former ex-prisoners still live under? Not forgetting the criminal records that have scourged their lives with these people and others still criminalised under the current regime. In this statement Theresa Villiers conveniently overlooks the terrorist attacks carried by those ‘doing their duty’. The victims I’ve been working closely with have spoken up, my question for the rest of the herd is will they continue blindly?